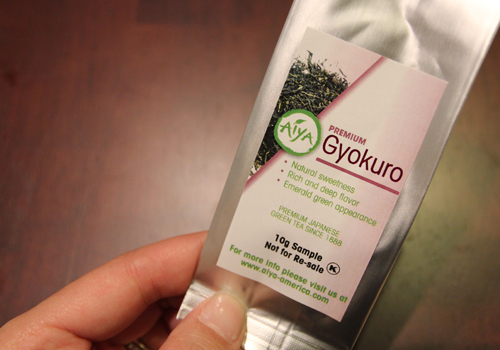 Aiya has recently launched consumer-sized tins of their Japanese loose leaf teas, and I was fortunate enough to receive a sample of their premium gyokuro tea. If you’re not familiar with gyokuro, it’s a fine Japanese green tea that’s grown under shade (unlike sencha, which is grown in the full sun). The method in which it’s grown gives the tea a sweet flavor that is distinctive from other teas. 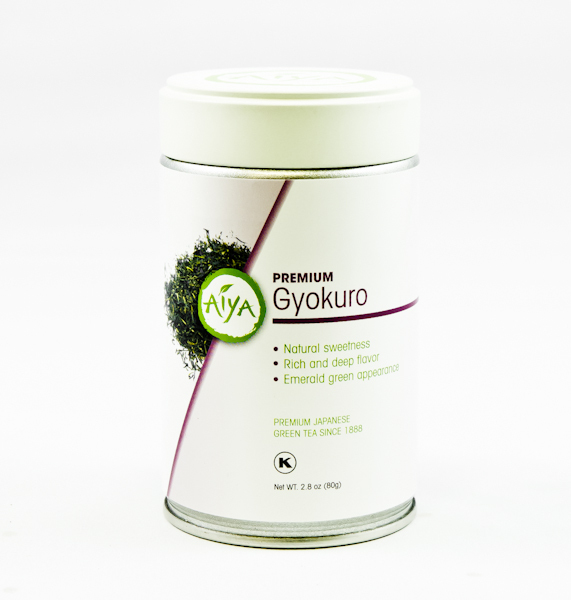 This tea is an excellent example of good gyokuro tea and worthwhile to try if you enjoy green teas. It’s sweet and very light on the tongue. Refreshing Gyokuro tea. Elegant green leaf in a refined needle shape. Luminous emerald green colour in the cup. Delicate, sweet, fruity, seductive aroma with a hint of Nashi pears on the finish. 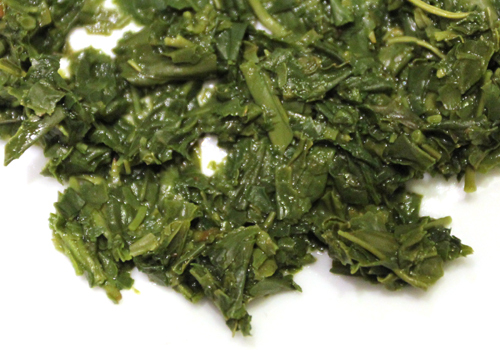 Light, fresh, mild – the pleasant sweetness of this Gyokuro is refreshing on the tongue and palate long after drinking. 12g tea (5 tsp), 1 litre water, temp. 140°F/60°C, steep for 4 min. The dry leaves are a beautiful, deep emerald green, cut into many small, spiky fragments interspersed with longer, thin grass-like blades of lighter green. The scent of the dry leaves is rich, sweet and grassy. It’s very reminiscent to me of matcha powder. As with all green teas, be very careful about the temperature at which you steep it. Notice that the tea calls for 140 degrees fahrenheit, which is a lower temperature than many teas. If you brew it with boiling water, a common mistake, the fresh tea leaves get cooked by the hot water and the resulting brew is bitter. After it’s steeped, the color brightens to a lettuce-green. The leaves expand and smell fresh, grassy and slightly vegetal. The liquor comes out a clear, bright yellow. The tea steeps out very mellow and smooth. There’s a tartness to the initial sip which balances out and adds richness to the lingering sweetness. The taste is quite strong, so I’d consider experimenting with a shorter steep time than the recommended 4 minutes. Overall it’s an enjoyable cup. I like this tea compared to many of the green teas I’ve tried. What I like is that the tea has a rich flavor which isn’t too heavy. 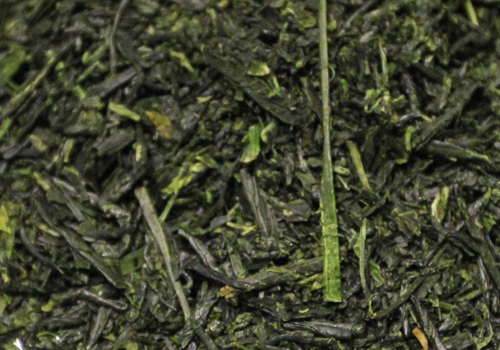 However, it sidesteps the kelpy seaweed-like taste which accompanies many grassy green teas. Definitely a tea worth trying. Find more information about this tea at Aiya’s website.